This amazing image of the front of what is now Bailiffgate Museum in the snow turned up recently. We have little information about it, however. There is no mistaking our distinctive pillars and gates. At the time these would have been the gates of St Mary’s Catholic Church. There are several intriguing aspects to the image. 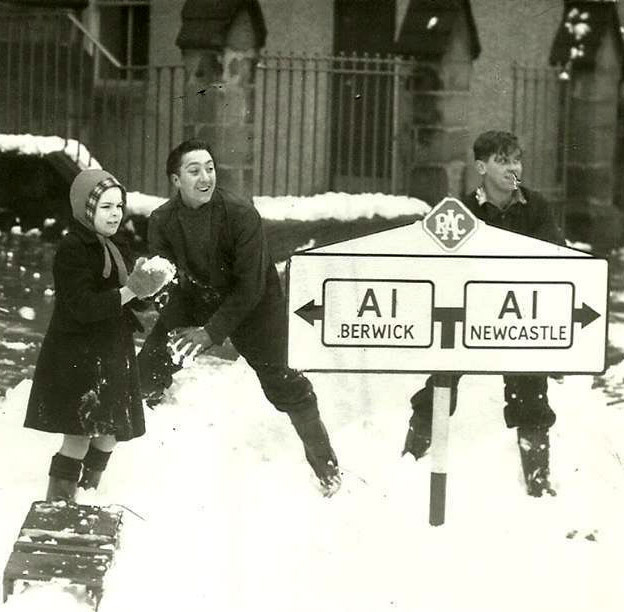 First of all, it is clearly from the period when the main A1 ran right through the centre of Alnwick. Just look at that lovely old road sign. The A1 actually followed a route up Bondgate, through Narrowgate and on northwards. Imagine what it would be like with the level of traffic that goes up and down the Alnwick by-pass nowadays! Apparently even then it was a regular occurrence for large vehicles to get stuck navigating their way through the arch in Hotspur Tower. It is also said that the police used that arch as a pinch-point to halt any criminal element that had been up to no good and was making their getaway up the A1. Secondly what year exactly was the photograph? From the clothing we guess about the 1950’s. It has been suggested that the boys were mechanics from the garage that used to be situated opposite the church. You may know better however. Maybe you could identify someone in the picture, or indeed it may be you! If so Bailiffgate Museum would love to hear from you.